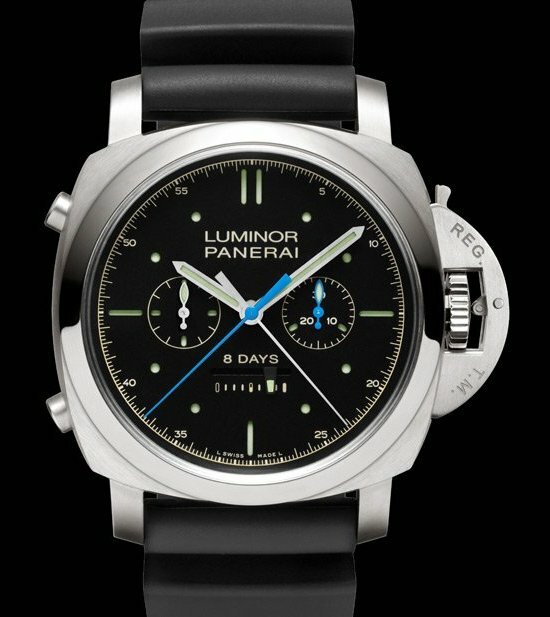 Officine Panerai presented the new Luminor 1950 Rattrapante 8 Days Titanio, a split-seconds chronograph with vertical clutch and twin column wheels. Almost identical to the Special Edition PAM00427 (limited to 500 pieces), the new PAM00530 features a sapphire crystal allowing to admire the beautifully finished P.2006 movement instead of the engraving of the logo of the Panerai Transat Classique 2012 yachts race that was used for the PAM00427. The split-seconds function, also known as rattrapante, operates two hands that are superimposed and partially independent: the main hand is controlled by the pusher at 8 o'clock, which starts, stops and resets the chronograph hand; the second, controlled by the pusher at 10 o'clock, can be used to measure partial times or a second event simultaneous with the first. The hand of the small minute counter moves in jumps instead of continuously. The P.2006 hand-wound movement has a long power reserve of eight days thanks to the patented system of three spring barrels. The remaining power reserve can be read on the dial from a linear indicator above the number six. The Luminor 1950 Rattrapante 8 Days Titanio has a brushed titanium case 47 mm in diameter, fitted with the classic lever device which hermetically seals the winding crown to ensure water resistance to 10 atmospheres (equivalent to a depth of about 100 metres). 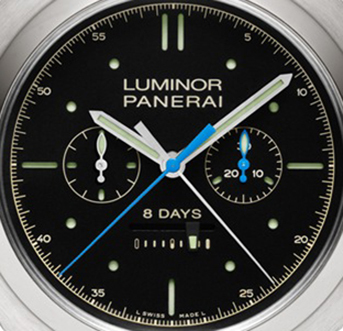 The black dial is characterized by the circular Super-Luminova hour markers at 1, 2, 4, 5, 7, 8, 10 and 11 o'clock. 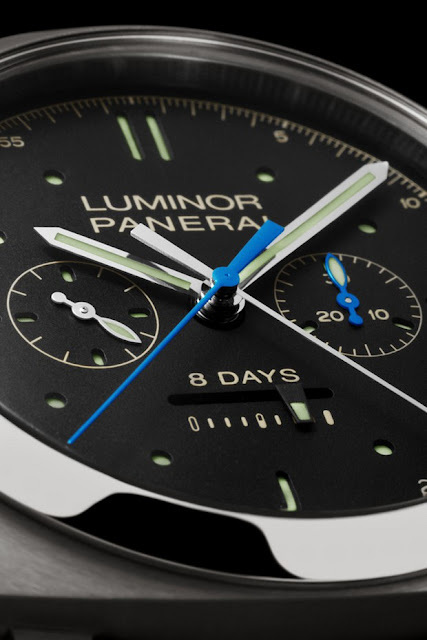 The new Luminor 1950 Rattrapante 8 Days Titanio is supplied with a rubber strap and it is part of the of the Officine Panerai Specialities collection.